Many thanks, where are you going in November we're off to Malaga? We're off to Tenerife. Hopefully still hot in November. As it is an early flight, it'll be croissants in the lounge and full English breakfast on board (well, I'll eat the bacon and sausage and bread roll). The Rotations are set in stone, seemingly, moreover so far the menu contents have not altered since they started in the Spring. I guess they will change at some point, but as far as I can tell, November is the same Rotation A as last time. If you check back here in the first few days of November usually someone will have posted something new, but I doubt it will change. Thanks - am going in the middle of November so will check back before then. Added CWS's useful post 1175 into the Wiki since we seem to get a lot of questions around that. Feel free to modify as appropriate. Got the "Long short-haul" treatment LHR-HEL-LHR again for a change. Total inconsistency. One way we got the full treatment, starting with a drinks service, tray served from trolley, mains served individually and coffee/tea service individually. So everything was spot-on par the lack of menus. Well, at least we get 2 forks and 2 knives nowadays. It also seems I should be happy to just get fed on a flight nowadays. Fantastic service in my LHR - GLA yesterday - drinks run with cashews followed by a nice meal service and multiple top-ups offered. Champagne was chilled and the crew were fantastic. Was only four rows of CE which maybe helped. As previously mentioned it is the total inconsistency in service levels and styles that is frustrating. When you get a good crew CE can be a very enjoyable experience. Next week I have four sectors with KLM and Air France in short haul business and am quite intrigued to see how they compare. Really miss the fresh fruit from the tray... but hey, now we got a bread plate! The vegetarian omelette on the same LHR-MAD flight. I always order this SPML but I just can't eat it now. Oily, waterry yuk. Could you please say what time your flight was leaving? SPML for short/medium vary by meal window so the information is important. Thanks. I find this the case one sector drinks served followed by meal ( if you can call it a meal) on return drinks served with coffee/tea). This costs BA nothing except proper training, cabin crew should all be trained to one standard which is down to management. On the subject of meals, why can’t BA serve M&S ready meals surely better than the crappy panini! To be honest I only fly CE for tier points, and try to get them on Asian carriers where they know how to do service. Once I reach silver each year am relieved to not have to endure the abo y of CE. Lounge food is preferable to on board dining any day! 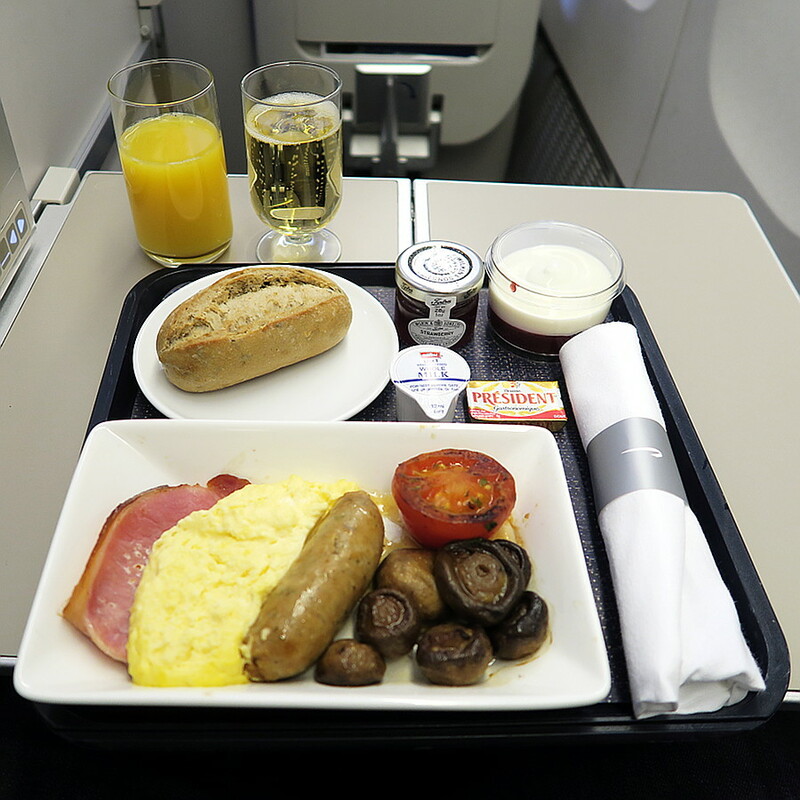 That doesn't look too dissimilar to the IB breakfast I was recently served on same route, except on IB there was a small fruit plate and some other extra bits and bobs on the tray. The menu containng beef check is my favourite one. A very minor issue is that the oatcakes and hazelnut tower look similar from above. It is a little bit dull. Luckily the taste is different and event the dessert is wonderful.